The very idea of what is a phone call is changing, and changing fast. What used to be a fixed phone turned into anywhere calling. Now Facebook, Google (s goog) and Skype (s msft) have made calls about video chat, friends and social circles, not phone numbers. It’s perhaps time to rethink the very notion of a phone call and what defines the classic phone network. Tom Evslin, who has spent his entire life in telecom and data services industries, believes it’s time for Federal Communications Commission (FCC) to come to grips with the reality that people are choosing cellular or Internet voice over traditional phone systems. He points to a recent report from the National Center for Health Statistics that notes that by 2018, only 6 percent of the U.S. population will be using the public switched telephone network (PSTN), which to non-telecom geeks means: your home phone from the phone company. Target 2018 as the end of the PSTN. Assure that mobile and/or broadband replacements are available everywhere PSTN is currently provided. The need will be greatest in role areas. Update the National Broadband Plan to support the PSTN transition. Change the Universal Service Fund (USF) funding and spending to support universal coverage and other social goals. Further investigate emergency service impact to assure a suitable replacement capability. As he points out that the Universal Service Fund (USF) that subsidizes the PSTN in rural areas is going to continue to shrink as more and more people opt for non-PSTN calling options. What happens to the telephone network then? Tom recommends that perhaps that sunset-ing the PSTN should be synchronized with the National Broadband Plan. It would make sense, though as far as I’m concerned NBP is a white elephant. That said, Evslin is right in saying that perhaps it’s time to start thinking about lower-cost options to the old-fashioned phone network. And when we are doing that, it’s time to think not about the past but about the future: what communication means in the 21st century and not in terms of something that started almost a century ago. Wednesday’s Facebook-Skype partnership is a good reminder of that new reality. There are still areas of the US where wireless service is unreliable or even non-existent. In some rural areas mobile is a hit-or-miss proposition off the major roads. Landlines will continue to be important to these folks until their wireless providers equal landline reliability. The problem with Evslin’s view that the “the PSTN would probably disappear before 2018 since the carriersâ€™ cost to maintain the many miles of copper and the rest of the system doesnâ€™t go down nearly as quickly as revenue from subscribers declines” is that those copper wires aren’t just being used for traditional voice service. They’re helping to deliver broadband service. Even if everyone stopped subscribing to landline phone service today, we couldn’t just rip out the old copper wires; they’d be needed to deliver a broadband connection. Yes, over time they’re being replaced by fiber, but that not because a landline connection isn’t needed, it’s because fiber is faster. Charles Wu makes another excellent point about wireless phones. They depend on that copper/fiber network that is running throughout the country. Those phones won’t work without it. Another need… the equivalent of the city phone book… a free-access listing of phone numbers. We maintain a landline so we can be located. Voice Networks are fast disappearing! Soon Telecom Networks will be all Data! Most of the new Telecom Networks being built in the Second Decade of the 21st Century are geared to be all Data. Landline is being abandoned in droves. I think the bigger question is when will people stop using fax machines as they don’t work well with SIP. Emegency/fire lines/modems are also big users of PSTN rather then SIP as well. When will these type of things be fully ip based? If it’s about cost of copper. What is the cost support that POTS has to enable DSL which many people use to get on the internet. Is the premise that the copper will no longer be used and it can be left unmaintained. Can wireless support all communications services. Telcos believe that revenue is about the Applications layer, but their utility is the physical layer. 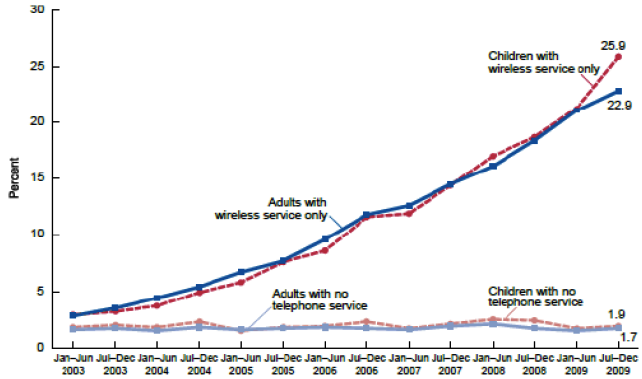 The charts showing the steady growth in consumer reliance strictly on cell phone service is interesting. The Telephone Consumer Protection Act (“TCPA”) prohibits collection agencies from calling many people on their cell phone using a predictive dialer or auto-dialing device. The TCPA allows consumers to recover statutory damages to cell phone owners who they call using automated devices. The debt collectors’ trade association is lobbying to attempt to persuade the FTC or Congress to allow debt collectors to not only call without a practical limit, but call people on their cell phones. Because the Fair Debt Collection Practices Act (“FDCPA”) does not provide any express limitation on the number of calls and debt collectors are allowed to call even if an account is time barred (expired under the statute of limitations), they’re seeking to establish a cell phone hades not only for people that experience financial hardship but also for anyone they chose to call. Technology has changed in some ways. Not only do consumers now rely increasingly on their cell phone service, debt collectors bombard people inexpensively using robo-dialers often based upon erroneous information obtained from a data-base. Here in the UK, at least, you *need* to have (and pay for) a landline telephone before you can sign up for ADSL broadband, which remains far more prevalent than cable as the way online. So houses up and down the country have those odd ‘telephone’ things sat in the corner, unused except when telemarketers cold call. Until *that* requirement shifts, the traditional telephone will unfortunately stick around. Does the U.S. have similarly antiquated rules? No, we do not. Telcos encourage voice use when selling broadband service (either DSL or digital/VoIP), but do not require voice (at least locally). How enlightened. I hope Ofcom takes note! I got rid of my land line years ago been using magic jack. Instead of 30 bucks a monto it’s 20 bucks A YEAR. I think a cost benefit analysis would simply prove that the money spent on subsidies for traditional land lines grossly out-weighs the benefit received from it, especially when you look at the high sunk cost, high fixed cost scenario that it is. The trends are obvious as stated above. Who needs land lines anymore?